These silver tone plated Celtic drop earrings feature an embossed spiral design along with jade color stones. These silver tone Celtic drop earrings feature an embossed spiral design. 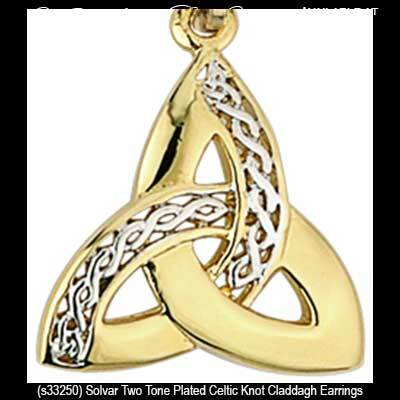 These silver tone Celtic earrings feature a spiral motif with gold plated accenting. These silver tone plated Celtic drop earrings feature gold tone Trinity knots along with amethyst color stones. 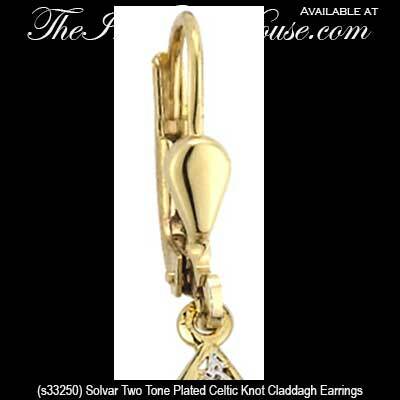 These gold plated Celtic drop earrings feature Trinity knots with engraved knot-work. Sorry, these dangle Trinity earrings as now sold out. These gold plated Celtic stud earrings feature Trinity knots with green enamel accenting. Sorry, these Trinity stud earrings are now sold out.